Established in 1882 as University of Punjab at Lahore (now in Pakistan). Panjab University has been Accredited with a CGPA of 3.35 on a four point scale at A Grade valid for a period of 5 years from 25/06/2015. 1st among Universities of India and 38th in Asia, Times Higher Education Asian University rankings 2015. Ranked 39th by the Times Higher Education among BRICS & Emerging Economies. University campus is spread over an area of 550 acres (2.2 km2) in sectors 14 and 25 of the city of Chandigarh. 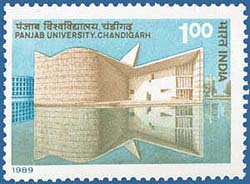 University has 78 teaching and research departments and 15 Centers/Chairs for teaching and research at the main campus located at Chandigarh. University has 188 affiliated colleges spread over Punjab and having one rural Regional Centre at Kauni, and 3 Regional Centres at Muktsar, Ludhiana and Hoshiarpur. University has 6 Constituent Colleges located at Sikhwala (Sri Muktsar Sahib), Balachaur (SBS Nagar), Nihalsingh Wala (Moga), Dharamkot (Moga), Mokham Khan Wala (Ferozepur) and Guru Harsahai (Ferozepur).